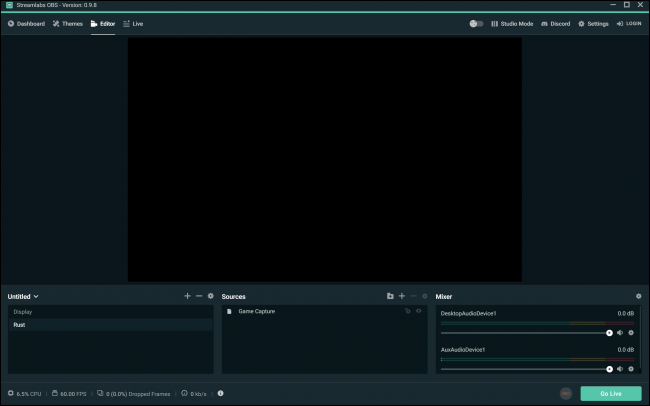 Streamlabs OBS is a modified version of OBS designed with streamers in mind. 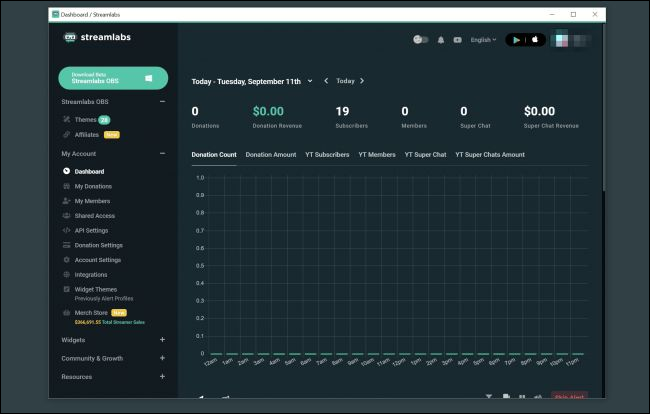 It adds support for themes and widgets, improving the look of your stream and adding support for many useful features, such as showing donations and subscribers on stream, displaying live chat on stream, and displaying sub goals and sponsor banners. 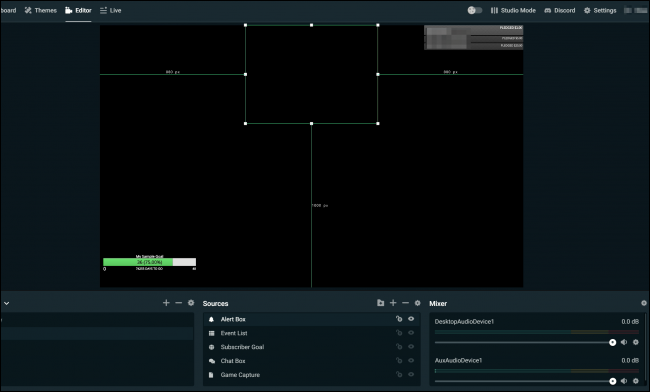 Streamlabs is available for Windows only (unlike OBS, which supports Linux and macOS). 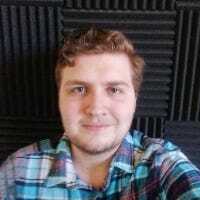 They also have apps for iOS and Android, for people wanting to broadcast their phone’s camera. 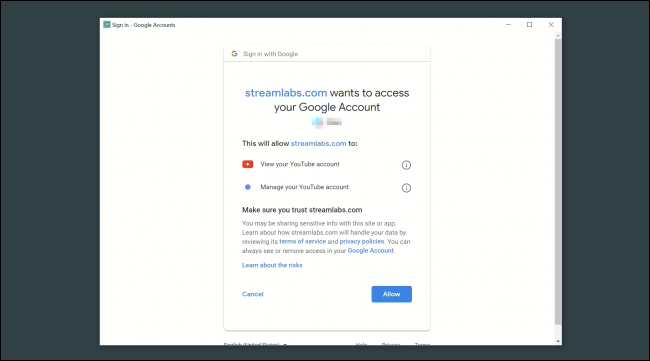 After you install Streamlabs, it will ask you to sign in to your Twitch or YouTub account and authorize the app to manage your stream. You can use it without authorizing, but many features will be disabled. 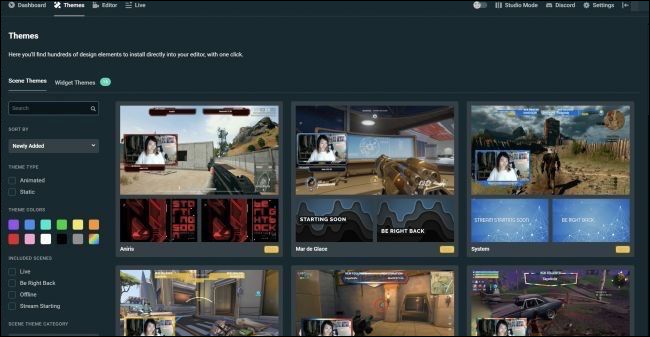 The first thing you’ll see will be your dashboard; this functions as Streamlabs’ settings. You can close out of this for the time being, but in here you’ll find controls for managing everything you could think of. Close this window, and move over to the “Editor” tab. If you’ve used OBS before, this interface will feel very familiar. From here, you can configure your stream and set up different scenes. This is where you’ll manage your input sources, all of your widgets, and the overall look of the stream. The big “Go Live” button replaces all of OBS’s recording settings, though there is a smaller record button right next to it. To get started with widgets, click the + button in the “Sources” group. 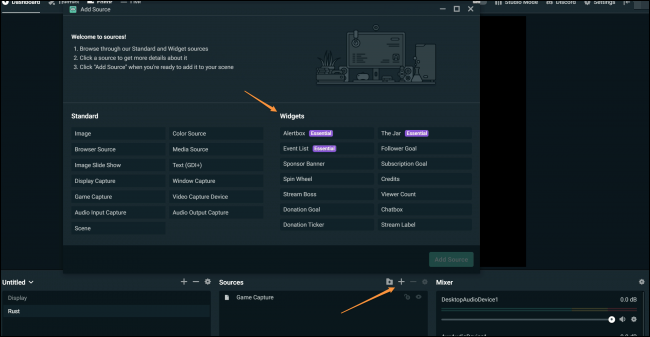 You’ll see a window with all the standard OBS options for display, browser, audio, and game capture, along with Streamlabs specific options. 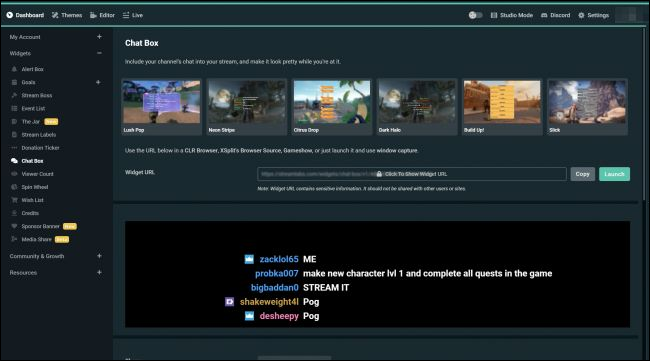 We’re going to go with “Chat Box” to display a real-time feed of our chat on the stream itself. After you add it, double-click it to open the settings. This is where you’ll configure the controls and settings for every widget. This chat box widget is pretty powerful, allowing you to write custom styles for it with the built-in tools or with CSS. It also has a bunch of themes already built in. Of course, you’ll need to position everything on screen correctly. Most widgets have a default position that works well, but if you want to move them around just click on them in the Sources tab and you can resize and reposition them according to your needs. The “Themes” tab contains premade templates for you to use. If you don’t want to bother configuring everything yourself, you can pick up a template from here. The themes don’t just apply to full templates though; there are themes for individual widgets as well.